Soft, rubber grips add both style and controllability to any full-size 1911 Auto. Thin, contoured shape provides additional support for the inside of the palm. Gives reach for shooters with smaller hands. Classic, double-diamond pattern with sharp 18 lpi checkering ensures a positive, no-slip grip. SPECS: Soft rubber, black. Re-enforced backing. Myk gummi grep legge både stil og kontrollerbarhet til noen full-size 1911 automatisk. Tynne, formet figuren gir ekstra støtte for innsiden av håndflaten. Gir nå for skyttere med mindre hender. Klassisk, dobbel-diamond mønster med skarpe 18 lpi checkering sikrer en positiv, nei-skli grep. Spesifikasjoner: myk gummi, svart. Forsterket backing. These grips offer great value! Fit perfectly on my Kimber Raptor II. They also offer much better traction than the original (wooden) Kimber grips. Used them now for 6 months and I have no complaints. those grips have good touch and i have combine them with the FINGER-GROOVE GRIP ENHANCEMENT.They are great for ther price.P.S i have a sig carry nitron 1911. 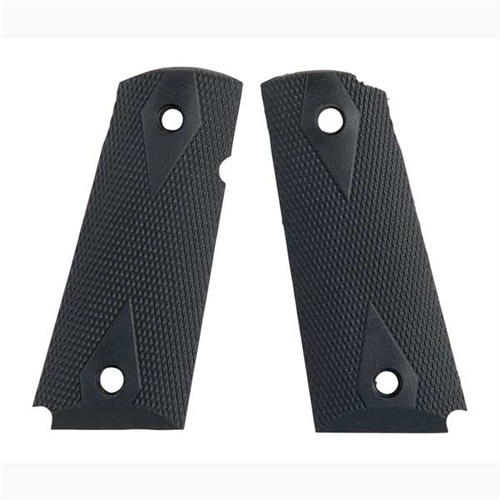 Solid grips for a great price! As I get older and my skin gets slicker it's harder to keep smooth gripped 1911s from shifting, especially those without front strap checkering. It doesn't help that I have short fingers so otherwise excellent wrap-a-rounds like Pachmayr never felt right in my hand. These were just right. Easy to install. Good fit. Soft rubber for a solid, nonslip grip. And slim to allow me the maximum finger wrap. 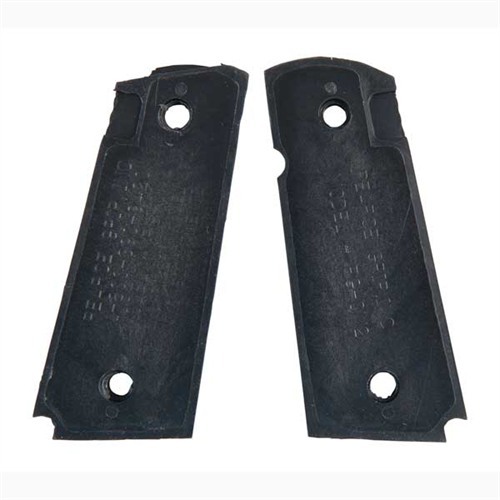 These eliminated the shifting problem on that 1911. Fits Springfield RO 5 inch, .45 cal perfect. Much more comfortable and offers better grip than CB wood panels that come stock. Seems much more ergonomic for shooters with smaller hands and/or short fingers. Plus you can't beat the price, great value. I did not give them 5 stars because I still have to see how they hold up to wear and tear. Speedy delivery by Brownells. Produsentnr. : PGOM2 605849400051 Myk gummi grep legge både stil og kontrollerbarhet til noen full-size 1911 automatisk. Tynne, formet figuren gir ekstra støtte for innsiden av håndflaten. Gir nå for skyttere med mindre hender. Klassisk, dobbel-diamond mønster med skarpe 18 lpi checkering sikrer en positiv, nei-skli grep. Produsentnr. : PG19112 605849400020 Myk gummi grep legge både stil og kontrollerbarhet til noen full-size 1911 automatisk. Tynne, formet figuren gir ekstra støtte for innsiden av håndflaten. Gir nå for skyttere med mindre hender. Klassisk, dobbel-diamond mønster med skarpe 18 lpi checkering sikrer en positiv, nei-skli grep.